ONTARIO — For week number nine of the 2017 high school football season, the Galion Tigers would head to Ontario to meet up with the Warriors for the first time in Mid-Ohio Athletic Conference play. The Tigers would come away with the victory over the home team, coached by former Galion leader, Chris Hawkins; 35-20. With the win, Galion moves above .500 on the year at 5-4 overall and now sit at 2-4 in the MOAC. Ontario drops to 2-7 on the season and remain winless in their first year in the conference at 0-6. Both teams would get the scoring started early on Friday. Galion won the coin toss and elected to kickoff to Ontario. The Warriors would seize the opportunity and take their first drive 65 yards for the score in seven plays. Ontario’s drive was capped by a 25-yard touchdown run with the added extra-point to put them up early; 7-0. The Tigers would receive take over on their own 23-yard line and would need just two plays to gain the 77 yards for the score. Tanner Crisman ran the ball for six yards on the first play, followed by a 71-yard touchdown strike from quarterback Harrison Ivy to wideout Takoda Crisman. Dominic Pittman tacked on his first of three PATs on the night to knot it up at seven points apiece. Both teams would go scoreless in the second quarter to leave the score at 7-7 headed into halftime. In the third however, Galion would put the game out of reach, scoring three touchdowns in the 12-minute frame. The Tigers first drive was finished on a one-yard touchdown run by Ivy, leading to a 13-7 lead after Pittman’s extra-point attempt was blocked. Trevor O’Brien would recover the opposing kickoff at the 50 to give Galion another quick possession. On that possession, the Tigers would score again, this time on a nine-yard touchdown run by Ivy. Ivy would proceed to convert the two-point conversion to put the visiting Tigers up; 21-7. Galion would tack on their third score of the quarter on a 24-yard touchdown pass from Ivy to Isaiah Alsip. Add the Pittman PAT and the Tigers found a comfortable lead at 28-7. Ontario would manage a 31-yard TD strike through the air before the third concluded but with the blocked PAT, the Warriors would head into the final quarter down 28-13. The Warriors would score their eventual final points in the fourth on another receiving touchdown, this time on a six-yard reception and with the extra-point, Ontario pulled the game to within eight at 28-20. Galion was not finished though and Ivy would connect with Alsip for their second touchdown on a 16-yard aerial strike. Pittman added the PAT and the game reached its eventual final score; 35-20. Offensive statistics for Galion were: Ivy- 8/19 passing, 222 yards, 3 TD, 30 carries, 119 yards, 2 TD, 2PC; Takoda Crisman- 4 catches, 141 yards, TD; Alsip- 3 catches, 47 yards, 2 TD; Tanner Crisman- 1 catch, 34 yards, 16 carries, 75 yards; Nakoma Breedlove- 4 carries, 14 yards; Joah Singer- 1 carry, 3 yards; Elias Middleton- 1 carry, 1 yard and Pittman- 3/4 PAT. Galion gained 426 total yards on 72 plays on Friday (222 passing, 204 rushing) and Ontario posted 261 yards on 46 plays (160 rushing, 101 passing). Defensively for the visiting Tigers, Gavin Pennington recorded an interception. Other scores around the MOAC were: Clear Fork (9-0, 6-0) 20 and Pleasant (7-1, 5-1) 17 in an overtime thriller; Harding (6-3, 4-2) 28 and River Valley (3-6, 1-5) 21; Buckeye Valley (6-3, 4-2) 21 and North Union (4-5, 2-4) 7. 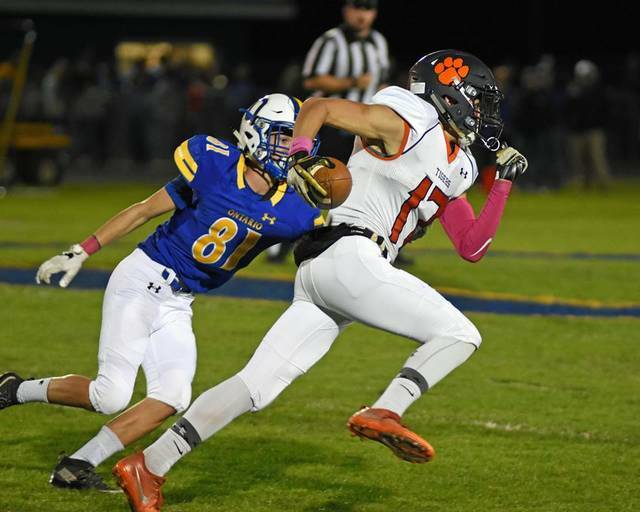 The Tigers will host Buckeye Valley in the final game of the 2017 regular season on Friday, Oct. 27 at Unckrich Stadium in Heise Park. The Tigers Takoda Crisman is off to the races against the Ontario defense during MOAC action on Friday night. Galion defeated the hosting Warriors by a final score of 35-20.
https://www.galioninquirer.com/wp-content/uploads/sites/38/2017/10/web1_Takoda.jpgThe Tigers Takoda Crisman is off to the races against the Ontario defense during MOAC action on Friday night. Galion defeated the hosting Warriors by a final score of 35-20. Galion quarterback Harrison Ivy hands the ball off to Tanner Crisman during the Tigers victory at Ontario last Friday night. With the win, Galion improves to 5-4 on the season and 2-4 in the MOAC. 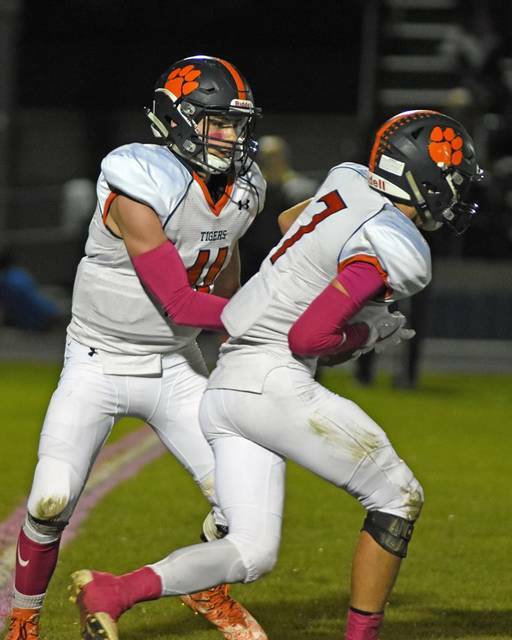 https://www.galioninquirer.com/wp-content/uploads/sites/38/2017/10/web1_H-to-Tanner.jpgGalion quarterback Harrison Ivy hands the ball off to Tanner Crisman during the Tigers victory at Ontario last Friday night. With the win, Galion improves to 5-4 on the season and 2-4 in the MOAC.